Consider some creative office party ideas to liven up your holiday festivities and add some fun to your work week. There are endless possibilities to consider so choose something that best matches your particular office's needs. Many work places hold office parties throughout the year for various reasons. Some throw a party to celebrate a holiday such as Christmas or to recognize a special achievement. Other parties are thrown in honor of a retirement, birthday or anniversary. No matter what the reason, office parties are a part of many work environments. Many people dread the office party, but if it is planned properly and done in a fun way, there is no reason to dread it. You can even look forward to it. 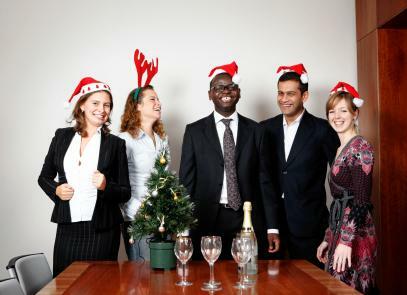 Office parties can be held at the place where you work or at an off-site location such as a restaurant. Depending on the reason and when the party is to be held, make sure that the space in which you are planning on holding the party is big enough to comfortably hold all the guests. Nothing can be worse than a cramped room with little space to move around in. Some pre-planning requirements include getting an idea of how many people plan on attending the party, deciding whether or not food will be served and what time the party will be held. A budget will also need to be set for the party in order to know how much money has been allocated for the event. Invitations for an office party can be informal and done via email or printed and set on each person's desk or in their mailbox. An invitation should also be posted in the office on the company's bulletin board or a place where everyone is sure to see it. Once you have decided that your office will be holding a party, consider using a creative theme to add fun to the mix. There are endless ideas to use, so try something different this year to make the party more interesting for all attending. For example, an office holiday party can be turned into something fun and unforgettable. If the company is not paying for the party, you may want to hold it off-site and after work hours. However, since this is an office party, be sure to hold it at a convenient location close to the office. The party could be held at a co-worker's home or at a local restaurant. If holding it at a home, consider making it a potluck so that not just one person is taking on the burden. Keep the party as stress free as possible so that it can be enjoyed by everyone involved. Decorations can be as simple as fresh flowers done in a red and green theme as well as using some traditional Christmas decorations. Remember that providing excessive alcohol at office parties is never a good idea. Be sure to have alternatives on hand such as punch and soda for those not wishing to partake in alcoholic cocktails. Have a gift exchange where everyone pulls a name and is responsible for getting a gift for the person they get. Be sure to set a specific amount so that everyone gets a gift valued at the same price. A gag-gift exchange is also popular for an office setting and can lighten up the event. An after-hours reception can be held in a conference room or a gathering place in your office building. This type of party is simple to do and can be as basic as serving hors d'oeuvres and wine. People are free to come and go as they please and there is little planning or preparation involved. Add a few fun games to the party. Games can be anything from trivia to Name That Tune. They are also a great way to break the ice and get everyone talking. Hold a monthly birthday party that includes everyone who has a birthday during that particular month. This is a great idea if you work for a large company and holding parties weekly is not an option. A monthly party can be held in conjunction with a meeting or at the end of the workday. When coworkers retire, why not surprise them with a party at work? Hold a surprise retirement party on the last day that they are scheduled to work. A luncheon can be a great way to recognize their achievements and show them that they were appreciated by the company. Maybe your company had a major accomplishment or received an award. What better way to boost morale and bring everyone together than with an office party? The most important thing to remember is to have fun. Office parties are meant to be an enjoyable event where you can mingle outside of the work environment. Good food, conversation and a lot of laughs guarantee the success of any party, especially an office party!